G2E 2018 genuinely buzzed; the optimism that always marked this event had finally returned, and the floor was absolutely alive with energy. Why the change? Probably the recent sportsbook ruling in the US, which meant the scope of the show was also a lot broader than it might normally be. Visitor numbers appeared to be up, and spread more evenly across the three days, and every exhibitor we met was very happy with the event. 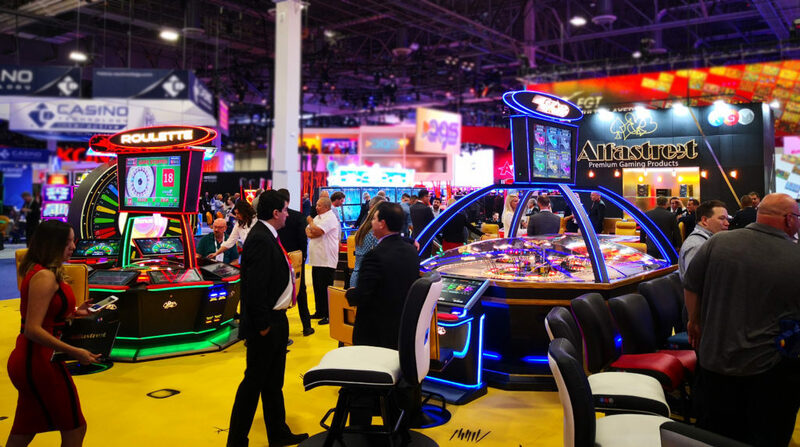 This year’s G2E in Las Vegas was special for Alfastreet in many ways. Most importantly, the company presented a completely new generation of gaming platform that combines an unlimited number of live and automated games, together with a progressive jackpot system, tournament modes and much more. This platform is a direct result of a refreshed and redesigned approach to the development process that was initiated early this year and is already bringing excellent results. We can positively say that Alfastreet turned a new page at the G2E and the excitement level is at the maximum. The company also recently completed construction of a new manufacturing facility that will effectively double the production capacity of the company. With distinct progress in key markets like US, Asia and Europe, and even Africa catching up, Alfastreet is thankful and motivated to continue with the production of top performance products and the continuation of its dominance in the world of Electronic Table Games. Gaming Partners International had a very successful showing at this year’s G2E. As a proud and leading global manufacturer and supplier of table game products, GPI showcased its newest currency security feature offerings alongside the latest advancements in its playing card offerings and new and innovative SMART RFID solutions. GPI recognizes and understands that currency security is one of the most important concerns facing gaming operators which is why we offer the industry’s largest portfolio of currency security features available. A commitment to continually provide customers with new and unique security options using the latest technological advances available, GPI introduced two new options, the Hollow Shot, available on BG V-Series moulded chips and Intricate Edge Inserts available on both BG Premium chips and Paulson traditional compression-moulded chips. The Hollow Shot is a one-of-a-kind currency security feature that is integrated into the chip’s design, a specially-designed indentation in the chip’s outer ring that serves a dual purpose in the chip’s overall aesthetics and counterfeit deterrence. GPI’s Intricate Edge Inserts were developed using the latest manufacturing techniques, so customers can now include multiple, more complex designs into their chip edge inserts. This new advanced feature allows for the inclusion of more complex edge insert designs that cannot be achieved through traditional injection moulding methods. As a result, customers can incorporate edge inserts with multiple colours, designs and security taggants. It’s certainly a sign that the company’s US venture is doing well, and Dennys elaborated: “We’ve been growing constantly since we started the business here, and that’s also why we tripled the size of our G2E booth this year – that pretty much reflects our growth in the US market. In the past 12 months we have grown our sales team in the US to five; we’re working with some major operators now. “We have created a range with new designs and improved comfort to accommodate the tastes of the US market, which has been approved by our customers immediately. Every year, AMD makes it possible for game designers and developers to do their jobs more effectively and more creatively, and 2018 has proved no exception. G2E allowed the company to show off some of the work being done by their customers and partners, as Mitch Furman explained to Casino International. He said: “One of the main points of this show for us its to show off all of the AMD Ryzen Embedded V1000 board partners that we’ve had. We have a dozen different board partners that have alunched it; the V1000 is our top-of-the-line new quad core APU with integrated graphics. These are major projects from our customers. “We have had lots of good success so far in this market policy with all these partners and we have different examples of what the V1000 is capable of. If you look at what Quixant have developed, we have a high-end 3D solution at 130fps in HD, whilke playing a 4K video at the same time, all from this small box – and this box could have up to nine display outputs simulataneously. “We also have a new project called FreeSync, which gives the ability to synchronize the 3D output of an application to the display output of the monitor. That means if a 3D application might do a variable of 50, 45 frames per second, always changing, but a monitor does 60 hertz, forever. If they’re out of sybc you will see tearing on the screen. It’s the same speed, it’s just that the outputs are out of sync. But now you can sync them up, and it looks great. Sometimes people think tearing means poor output, they need a better card or whatever, but in fact it just needs synchronisation. Now, if the application knows it is running 60fps, it can now tell the monitor ‘hey, go to 60 hertz’.” Simple but quite brilliant, our industry is so much richer for AMD’s commitment. One of the most pleasing things about Zytronic is that the company is entirely self-sufficient, as Robert Spencer, Director of Sales for the Americas, told us – and that means innovation is never far away. He said: “We’re completely self-sufficient, glass comes in, touchscreens go out. We do everything in-house. We also build our own demos in house for tradeshows, so every year there is a new demo.” The demo at G2E was Hungry Hippos, which the company had done in an entirely new way. Robert elaborated: “What we have here at G2E is a Hungry Hippos demo, with four floating buttons. What we did was, we cut holes in the glass, and we ran the active touchscreen areas all the way up to and surrounding the buttons, so the entire screen is touch-enabled. You of course need to power this button somehow, and this is a great innovation, we figured out how to power it without showing a trace of the power line. You won’t see buttons in displays like this anywhere else. We have patent pending on that right now. Nobody has ever put a button inside an active area, it’s usually a touch deck or something similar. TransAct’s Rob Denham summarised G2E very nicely for us, explaining that the event had been excellent for the company. He revealed: “G2E was a fabulous experience this year. It was interesting because G2E is usually more about the casino industry whereas ICE for example covers multiple facets of gaming. This time around, because of the regulation change in US sports betting, people were there to discuss other aspects other aspects of gaming, not just casinos, so it was a good show. “We were pushing Epic Edge, our next-generation printer, the most technologically-advanced TITO printer on the market. We recently won a major casino group opening in the US; a lot of customers were very interested in that at the show. “And of course we were showing the latest version of Epicentral, the casino marketing suite. It had a lot of interest, we are seeing some real momentum behind people who want that help with targeting non-carded players. GameCo’s booth was… Put simply, a quantum leap forward in gaming terms. The new SoulCalibur game looks like and appears to play exactly like the arcade and console classic; it was near-impossible to find time to play it, such was demand. This might be the magic bullet everyone wants for skill gaming, the title that gets a new breed of players into casinos and lights up this still-new gaming category; in short, it looks absolutely fantastic. Elsewhere, Nothin’ But Net II has seen big improvements, and the company is making great strides in its offering across the board. CEO Blaine Graboyes spoke with Casino International at the event; he said: “I’ve made video games a long time, and film and TV. I always say the difference between an ‘A’ and an ‘A+’ is exponential, it’s not linear or incremental and to be really self-reflective, we are not A+ yet but we are starting to ride that exponential curve of improving the product and delivering videogame gambling experience that’s thrilling and engaging, has that sense of instant gratification that you are looking for as a gambler. “Slot machines are a hundred years old. You would think after a hundred years, every single slot machine that comes out would be perfect. But the reality is, one or two out of ten is actually successful. So the idea that, for GameCo where we’ve created a brand new category of video game gambling, that our first one, two, five, ten games would be successful? We never thought that was going to happen; there’s a process of improvement and iteration, and what I believe is the key that will make us successful is humility. Watching people play, getting feedback, being open minded and making better games. It’s been an incredible few years for Aristocrat, widely acknowledged as being at the very peak of their powers in recent years. 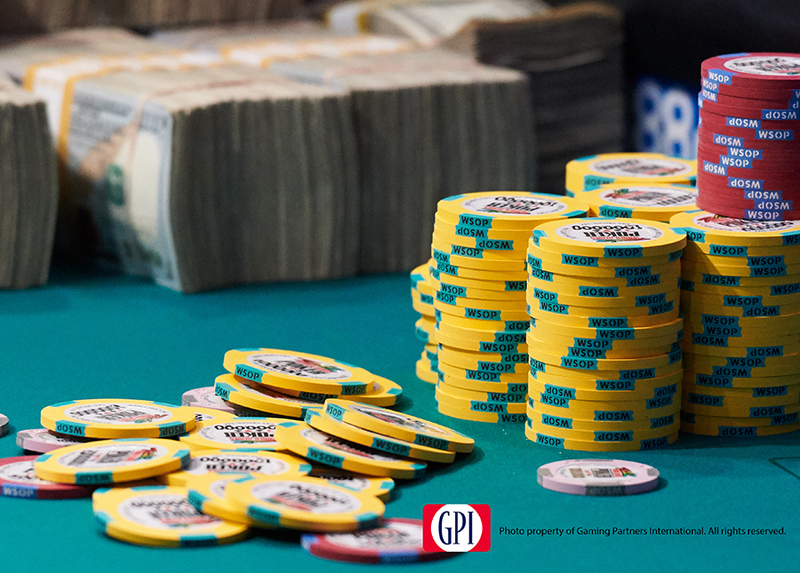 At G2E, the message was that it’s all about what’s inside – the game, the cabinet, the system, and the company itself – that makes the difference. Perennial favourite Buffalo saw a new iteration for its 10th anniversary on the flame55, alongside some very well-known licensed product, with slots for Big Bang Theory, Billions, and the excellent Westworld slot. The Edge X cabinet had the breathtaking new Mad Max: Fury Road slot, a beautiful looking game, and also the continuation of the incredibly successful – and really excellent – Walking Dead series, with number three making an appearance. The superb Lightning Link slot was the inspiration for Dollar Storm, with a first-of-its kind multi-level progressive action game that combines with a $100,000 MSP jackpot; this looks sure to create similar success for the company. Aristocrat’s Oasis 360 system solutions highlighted a multitude of products focused on developing a deeper connection with operators to help them be more competitive, efficient, and innovative. Solutions include Oasis Loyalty, a multi-site single card marketing and rewards solution; ONE LINK, our floor-wide bonusing, media, and progressive management solution; Drinks On Tap, an award-winning mobile drink-ordering system; and Oasis 360 Loyalty Kiosk, with a fully integrated enterprise suite of cutting-edge bonusing, reporting, card reprinting and marketing promotions. This was, for us, all about the Universal cabinet, the third stage of the company’s evolution from its electronic table games origins. They’ve not left that sector behind by any means, but the company is looking to help that segment evolve and that means, the Universal. Interblock founder Joc Pečečnik explained to Casino International that this is “the first time ever that electronic table games are represented by a single station, with mechanical generators on top… We have dice, Sic Bo, Roulette, Blackjack and Baccarat – for single players, with a mechanical generator on the top. It’s beautiful and exciting to play. Each cabinet has its own games; we have physically made a mechanical generator with cards, dice, and roulette wheel – for a single player. 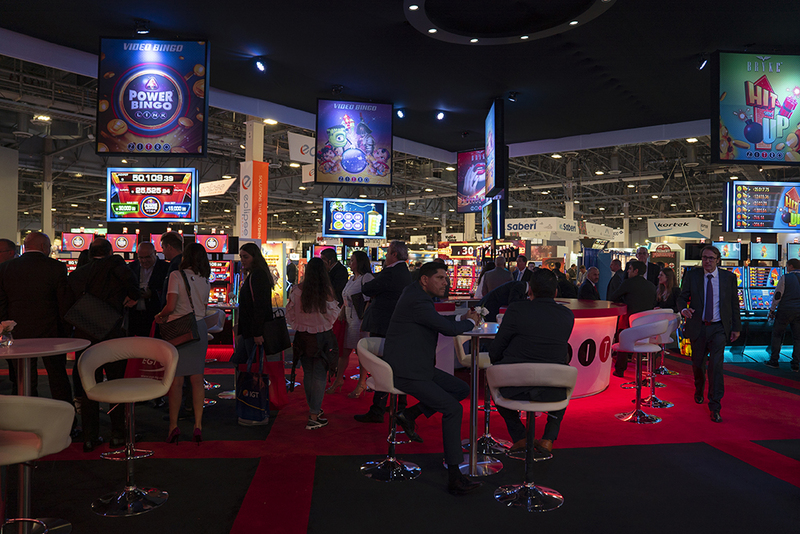 The company’s evolution does not end there though, with Joc’s eyes firmly on evolving the live table game – but that will have to wait for G2E 2019. AGS had a huge bopoth to accommodate more than 80 slot and table games, along with a full host of AGS Interactive solutions – all designed to deliver an exceptional player experience and help gaming operators boost their bottom line. AGS highlighted a host of engaging game content for its Orion Portrait, Orion Slant, and ICON platforms, designed to delight players and drive revenue for Class II and Class III markets. The new Orion upright cabinet took centre stage; this sophisticated new addition to the high-performing Orion family features dual 27-inch displays, a 21.5-inch LCD topper, LCD button deck, high bright accented bash buttons, a USB charger, and the Orion’s distinctive starwall design featuring 420 game-synchronized full-colour LED lights for an innovative gameplay celebration. AGS is launching the Orion Upright with a library of exclusive new titles and AGS greatest hits. For its Orion Slant platform, launched in May 2018 and already boasting an installed base of more than 630 games, AGS showed an array of new titles, including new Xtreme Jackpots titles, plus the new Fai Cai Shu and Kingdom Ca$h families. One of AGS’s must-see table attractions was Bonus Spin Xtreme, a progressive side bet to transform table game play. During this community or player-envy experience, players can win the chance to spin one of three virtual wheels which will generate multiple winners at the same table with each spin. Innovative Technology Americas reported a successful G2E with visitors expressing strong interest in their Spectral products, TITO solution and validators ideal for the popular sports betting market. Everi’s slots product has leapt forward in the last year or so, and they hit G2E with a excellent array of original game themes and licensed brand titles as well as innovative cabinets, focusing on breadth, depth, and being as flexible as possible for customers. The visual highlight was certainly the glorious Willie Nelson slot bank, though there was plenty to impress visitors. “Our newest form factor is the Empire DCX, an extension of our Empire base cabinet product line. Thanks to the triangular base you can make really interesting configurations and they can be tightly grouped together in small pod, or diamond configurations, so many choices. Everi is genuinely offering something different with their slots – there is a sense of fun and freedom about the line, from the mechanical steppers right up to the dual curve Empire DCX. We can see Everi’s slot market share expanding much further based on what we saw at G2E. JCM’s product line-up has diversified beyond recognition in recent years, and with the US legalisation of sport betting, they find themselves in a unique position as a supplier. This is in part thanks to the PixelPro range of screens, on stunning display on the booth. Tom Nieman told Casino International: “This show reflects the incredible enthusiasm with the passage with the sportsbook surge in the United States; everybody has it on their mind and with the states now moving towards legalising sports books, it’s a state rights issue; they’re starting at the brick and mortar casinos. They’re licensed, they’re of age, that’s where you put your first sportsbooks situation. As we all know what is critical to sportsbooks is you’ve got to distribute entertainment and information. Nothing does a better high-def LED screens. Hence why our PixelPro screens are here – we have a 56-panel a wall up showing that off. It’s both the wall and very sophisticated publishing systems behind it that allow you to put up multiple screens, odds down the side… there are a million ways to deliver both the entertainment and the information. “We want to show the flexibility of the screen, not only in the publishing of it but you can bend it, you can shape it, you can make cubes, a stack, a round display… the technology gives you so many options. 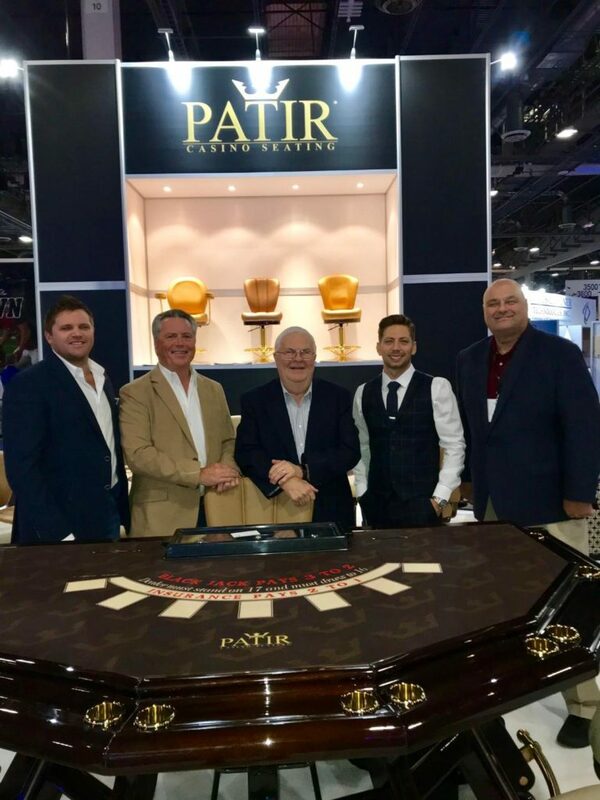 Cammegh showed the breadth of its gaming offer at the latest G2E show in Vegas, showcasing exquisite traditional table gaming products imbued with technological innovation. The company has signed a distribution agreement with Australia-based SenSen Networks to bring SenSen’s automated video-and-software system to table gaming via a low-cost table-mounted camera that records the number of players at a table; shows in real-time bets placed and their value, as well as game begin, duration and end time between games. All this data is sent to the casino data warehouse’s business intelligence and analytics software applications. Operational today at Crown Resorts, the SenSen solution delivers a dramatic improvement in operational efficiency, floor yield and customer insights without the need to replace chip stocks or change the way table games are dealt or played. The SenSen solution does not rely on RFID embedded chips, does not require new table layouts and from a dealer perspective there’s absolutely no change to the game itself. This year’s G2E marked the debut of several key product releases by Konami Gaming including its all-new KX 43 video slot cabinet, SynkConnect “cardless” player loyalty solution, MarkerTrax cashless slot credit, and a record volume of symbol-driven jackpot games across the Concerto Collection, from the Color Bloom series to the Thunder Arrow series. More than 26,000 casino representatives from markets around the world had the opportunity to experience a variety of games and systems technology aimed at meaningful player value and enduring entertainment. Steve Walther, Senior Director, Marketing and Product Management enthused to Casino International about the new products: “Our newest Concerto Opus cabinet, the 65-inch ultra high-definition display showing off our Treasure Ball product and our Diamond-Izer product has been something that everybody gravitated towards; we put it in a bank of six, two rows of three, and it’s the right size of big, enough to grab the attention but not so big that you can’t place it anywhere on the casino floor. That’s been a real crowd pleaser. Konami’s games have come on in leaps and bounds in recent years, and at G2E they showed a very real strength in depth of their game library. A very impressive showing indeed – and we haven’t even touched on their excellent skill gaming selection. GLI is the only independent testing and certification lab that can provide suppliers with access to every existing and emerging gaming jurisdiction. Attendees at G2E met with GLI’s team of experts and discovered GLI’s unsurpassed portfolio of testing, assessment, and certification services along with innovative “regulation ready” tools such as GLI Link and Point.Click.Transfer. 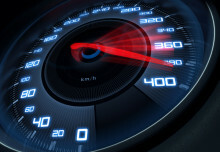 GLI can take your products everywhere in the world quickly, accurately, reliably, and cost-effectively. The company’s brilliant, award-winning, Test Automation was also much-discussed, an innovation that works 24/7 to help suppliers get their products on casino floors even faster, and with more quality and reliability than ever before. The great variety of Zitro products was presented brilliantly on its stand at G2E. Among the Bryke Video Slots, the stand-outs were the Multigame LAP range with panoramic sign, with the proven LINK KING star bank together with the new LINK ME bank, which is presented with new features and an extremely attractive theme. Zitro also presented its new Multigame LAP Hit me Up! next to the already popular LAP Blazing Pearls and Guns & Gold. In the range of standalone multi-game machines Zitro presented Smart Spins, which combines 4×5 and 3×5 games, as well as Spin Hit, a multi-game with new aesthetic games that complements the range of the proven Pick & Win and Hot Deal games. Win Systems CEO Eric Benchimol, looks back on a successful event for the company: “G2E is very important for Win Systems, as it is the main meeting point for our industry in the Americas which is our biggest market today. In 2018 edition we grew very much both in size (our booth was three times bigger) and even more significantly in the number of delegates visiting us and the business meetings held (we almost doubled them compared to 2017). As you can imagine, we’re leaving Las Vegas enormously satisfied with the job done and the outstanding results we achieved. “The sustained growth of our CMS Wigos, currently connecting more than 80,000 slots in almost 300 casinos worldwide, is based on 2 main pilars: the robustness and reliability of the system, providing full confidence to the operator on his day-to-day business, and also our commitment to provide innovative solutions that enable the casino to add significant value both to its operation and to its player’s offer,” he commented. Abbiati Casino Equipment brought their exquisitely-crafted high-end products for G2E’s visitors to enjoy: “Our main goal was to present our innovations in terms of new products and materials to give customers the opportunity to understand the passion and the efforts of our company in the manufacture of high-end products,” said Mr. Giovanni Abbiati, President & Founder of Abbiati Casino Equipment. The Big Craps table exhibited at the stand stood out among all the products presented at the show for its high quality manufacture and its refined details. Its fine walnut wood, named “Noce Canaletto”, and its gold PVD finishing provide it with a high standard of recognition by industry professionals; along with them, the high quality layout of the Craps table was appreciated by dealers and professionals as one of premium quality. The Director of Casino Education Group, one of the most prestigious dealer schools in Las Vegas, who ran the Craps game at the table at the booth, affirmed that the Abbiati layout is of premium quality and it is the finest he has ever seen and worked with. The RFID system for tracking chips and plaques interested visitors for its innovative functions: this is a PJM 3.0 RFID that permits casino operators to track their currency at the gaming table avoiding manipulation and counterfeiting phenomena. A dedicated station installed in the Abbiati booth permitted to show to customers how this system works and the modality in which it can assist casino management. The world-renowned seating company brought new solutions for seating in the casino, office, and hospitality, giving operators a well-rounded portfolio of cross-property seating options for guests. This included sportsbook seating, with the patented Monaco, Lido, Gazelle, Barona, Sierra, San Remo, Riva, Bleu, Vue, Capri, and Ohio. Each chair is customizable to fit each individual casino’s design, with a wide range of upholstery, finishing, and base styles to choose from. Also in the casino area, Gary Platt showed a new quick-change seat, the fastest and easiest in the industry which allows operators to easily switch out seats with just two bolts, getting players back in the game faster than ever before. The new quick-change seats will be available for Gary Platt’s X2 and NX2 models.